Cow yogurt on the left, goat on the right. I made the 24-hour SCD/GAPS yogurt for GAPS; both with cow and goat since one of my kids doesn't do well on the cow yet. I did them the exact same way, but the goat turned out runnier than the cow. 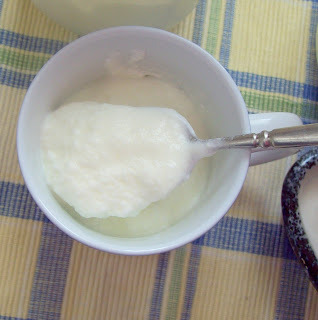 Goat milk fat is also white and naturally homogenized, so it has a little different properties from cow milk. This is just the goat milk in the purple carton that you can get in the dairy section from some normal grocery stores. 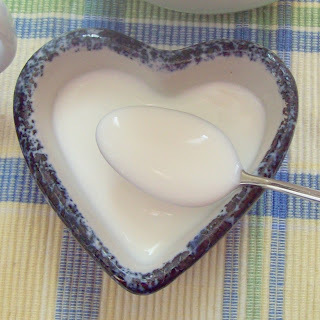 The SCD/GAPS yogurt is kept warm for 24 hours, so that the good bacteria have time to digest all the lactose. 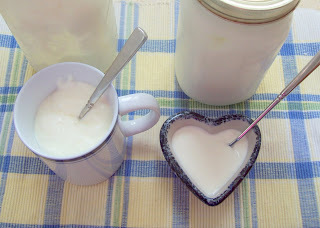 Having the yogurt be homemade and incubated for 24 hours really is an essential part of the diets, since any lactose that would be digested would feed the bad bacteria in the gut that we're trying to starve. Eventually, I'd love to have milk goats. I bought Raising Dairy Goats on Amazon about 10 years ago- via AOL dial up on the computer in my parents' bedroom. Some day I'll put this book to use! My kids love yogurt plain. I like it plain, but I also like it with raisins in it. We use it for dipping and as a topping on pancakes, or just eat it for a snack. I liked the idea in Wild Fermentation of combining the sourness of yogurt with savory flavors to compliment the taste of yogurt rather than trying to cover it up. Are you making yogurt yet? It's really simple, it's way cheaper than store-bought yogurt, and it's a great way to get good bacteria into your diet! More detailed directions to SCD 24-hour yogurt. 0 Response to "Cow vs Goat Yogurt"